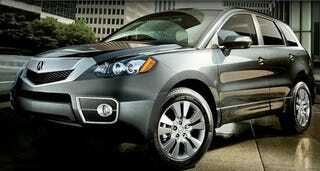 Yes friends, this is the 2010 Acura RDX and it's a special kind of ugly only imagined in the worst kind of horror films. Worse yet, they made SH-AWD optional. Doesn't matter. It'll probably still sell like gangbusters. Remember the Acura Legend? How about the NSX? Banish those thoughts of beauty and cast your eyes upon the revolting beast that is the 2010 RDX. It curdles milk, it makes small children cry, women faint in its presence. We're tempted to throw rotten tomatoes at it. Why? Just why. We thought the Acura ZDX was a monster, but this might just trump it.